The revolving door between the private sector and government bodies has been well established. 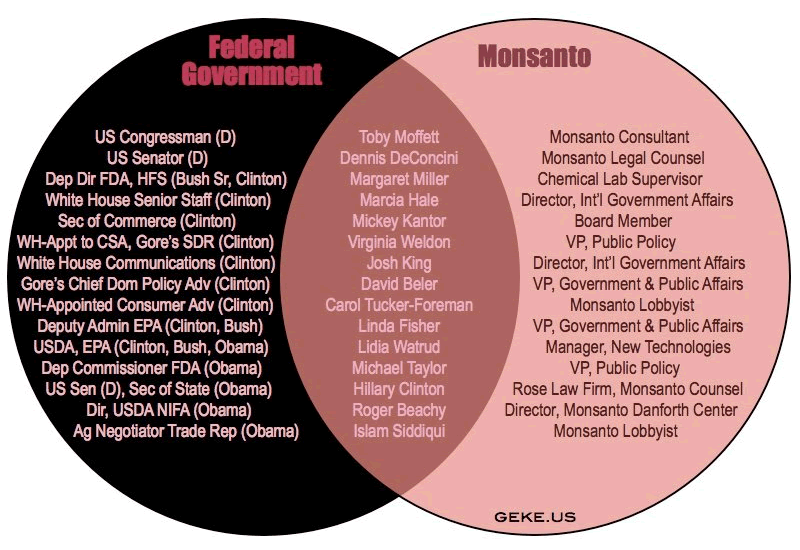 In the US, many senior figures from the Genetically Modified Organisms (GMOs) industry, especially Monsanto, have moved with ease to take up positions with the Food and Drug Administration and Evironmental Protection Agency and within the government. Writer and researcher William F Engdahl writes about a similar influence in Europe, noting the links between the GMO sector within the European Food Safety Authority. He states that over half of the scientists involved in the GMO panel which positively reviewed the Monsanto’s study for GMO maize in 2009, leading to its EU-wide authorisation, had links with the biotech industry. “Monsanto should not have to vouchsafe the safety of biotech food. Our interest is in selling as much of it as possible. Assuring its safety is the FDA’s job” — Phil Angell, Monsanto’s director of corporate communications. “Playing God in the Garden” New York Times Magazine,October 25, 1998. He worked with Monsanto for nearly two decades, including eight years as the managing director of India operations. A few years ago, he stated that Monsanto “used to fake scientific data” submitted to government regulatory agencies to get commercial approvals for its products in India. The former Monsanto boss said government regulatory agencies with which the company used to deal with in the 1980s simply depended on data supplied by the company while giving approvals to herbicides. As reported in India Today, he is on record as saying that India’s Central Insecticide Board simply accepted foreign data supplied by Monsanto and did not even have a test tube to validate the data which at times was faked. GM represents the so-called “Green Revolution’s” second coming. Agriculture has changed more over the last two generations than it did in the previous 12,000 years. Environmentalist Vandana Shiva notes that, after 1945, chemical manufacturers who had been involved in the weapons industry turned their attention to applying their chemical know-how to farming. As a result ‘dwarf seeds’ were purposively created to specifically respond to their chemicals. Agriculture became transformed into a chemical-dependent industry that hasdestroyed much biodiversity. What we are left with is crop monocultures, whichnegatively impact food security and nutrition. In effect, modern agriculture is part of the paradigm of control based on mass standardization and a dependency on corporate products. But anyone who questions the need for GMOs in the first place and the risksthey bring and devastating impacts they have is painted as clueless and indulging in scare mongering and falsehoods, while standing in the way of human progress. But can we expect much better from an industry that has a record of smearing and attempting to ruin people who criticise it? Are those of us who question the political links of big agritech and the nature of its products ready to take lessons on ethics and high-minded notions of ‘human progress’ from anyone involved with it? And it seems you can’t. So far, Bt cotton has been the only GM crop allowed in India, but the open field trials of many GM crops are now taking place around the country despite an overwhelming consensus of official reports warning against this. The work of numerous public bodies and research institutes is now compromised as a result of Monsanto’s strategic influence within India (see thisand this). “The hope of the industry is that over time the market is so flooded [with GMOs] that there’s nothing you can do about it. You just sort of surrender” — Don Westfall, biotech industry consultant and vice-president of Promar International, in the Toronto Star,January 9 2001. As powerful agribusiness concerns seek to ‘consolidate the entire food chain’ with their seeds, patents and GMOs, it is clear that it’s not just the health of the nation (any nation) that is at stake but the global control of food and by implication nations. “What you are seeing is not just a consolidation of seed companies, it’s really a consolidation of the entire food chain” — Robert Fraley, co-president of Monsanto’s agricultural sector 1996, in the Farm Journal. Quoted in:Flint J. (1998) Agricultural industry giants moving towards genetic monopolism. Telepolis, Heise.